As per the esteemed needs of our customers, we are involved to manufacture the drip pipe fittings in India. We are widely connected to supply our product to the varied places of India. 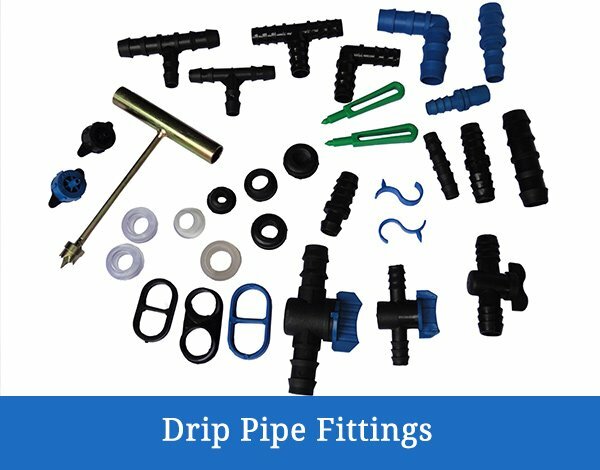 We are offering our clients, a wide range of Drip Pipes Fittings that are fabricated using quality raw material sourced from the trustworthy vendors of the market. Our range of fittings includes Flanges, Reducers, and End caps, Tee, Pipe Ends, and Bends along with P.P. Ball Valves. These are designed at par with standards and are demanded by our customers in domestic as well as in international market. Drip Pipe has smooth surface finishing and ensures accurate performance. These are moreover competitively priced and are at par with the international standards. The kit contains all the parts required for spray irrigation for a given area. Rain Hose is an affordable spray irrigation technology. It is a flexible hose with a pattern of drip holes. It is easy to install and maintain. These drip holes are made with nano punching technology to ensure uniform flow of water. Rain Hose is suitable for closely spaced crops, onion, vegetable crops, leafy vegetables, groundnut etc. This range of Drip irrigation pipe is known for its best quality and durability. We offer these Drip irrigation pipe at most affordable prices to our precious customers.